“I think we are pretty close to a laughingstock at this point,” Walter Shaub Jr. declared of the United States before he resigned as the director of the Office of Government Ethics (OHE) in July 2017. Two months later, former Assistant Professor at Emory School of Medicine Tom Price resigned as the Health and Human Services (HSS) secretary after Politico caught him spending at least $400,000 on private jets, a bill that is now being passed down to the American taxpayer. Four months after that, on Jan. 31, 2018, Brenda Fitzgerald resigned as the Centers for Disease Control and Prevention (CDC) director for holding tobacco stocks while heading an organization that is dedicated to eliminating tobacco use in the United States. Fitzgerald acquired one of those holdings after her appointment as director. The infection of Trump administration scandals has spread into Emory’s backyard, “drain the swamp!” continues to ring hollow and Shaub, unfortunately, continues to be proven right. This latest scandal feeds into two conflicting narratives surrounding the Trump administration. Are Trump’s questionable appointees starkly ignorant, or are they using their positions strategically to enrich themselves? Fitzgerald stated her investment manager purchased the stocks as part of a portfolio, and that she was unaware of her tobacco holdings. Even if that is true, political appointees and all public servants are meant to do their due diligence to divest themselves of compromising investments. Fitzgerald’s large stock portfolio being managed by an outside party is not the problem — but her lackadaisical approach to her own finances is. “Prior to accepting the CDC position, [Fitzgerald] owned stock in five other tobacco companies: Reynolds American, British American Tobacco, Imperial Brands, Philip Morris International and Altria Group Inc. — all legal under Georgia’s ethics rules,” according to the Politico report that broke the story. DPH’s response should be an immediate review and tightening of their ethical standards, otherwise they are severely undermining their own mission. Furthermore, early in December 2017, Fitzgerald came under fire from Congressional officials and the OHE for her financial investments in other medical technologies, including cancer detection. Per her ethics agreement, Fitzgerald was required to recuse herself from government activities relating to either interest. 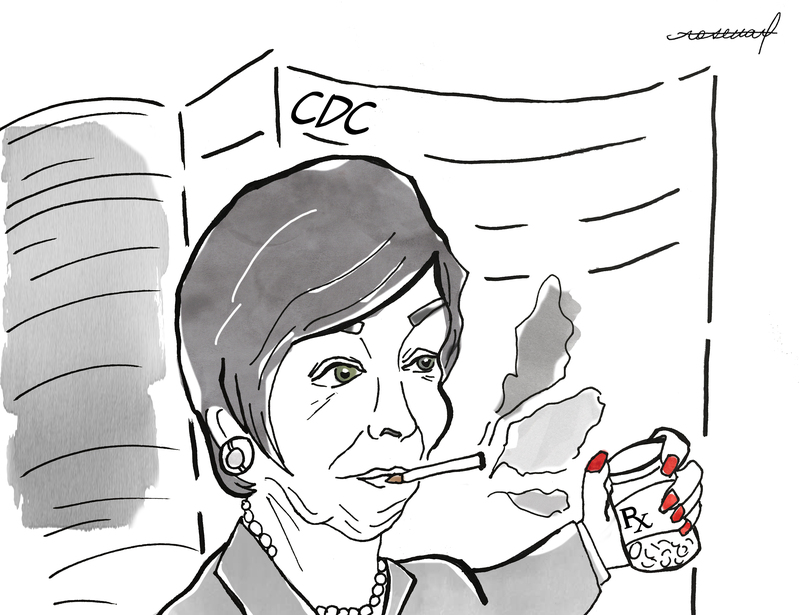 “I am concerned that you cannot perform the role of CDC director while being largely recused from matters pertaining to cancer and opioids,” said Sen. Patty Murray (D-Wash.), the highest-ranking Democrat on the Senate Committee on Health, Education, Labor and Pensions, which oversees the CDC, in a Washington Post article on Dec. 11. Fitzgerald responded by saying that she followed the rules of the OHE and her recusal only referred to “particular matters” pertaining to those topics — she claimed that Murray’s concern is overblown. Once again, Fitzgerald dismissed concern over conflicts of interest, instead substituting an ethical concern for a legal one. Perhaps we should believe the best case scenario. The complexity of Fitzgerald’s finances could ultimately have been the reason her divestments were never completed. But the public should be able to expect an appointed CDC director to perform all their duties in the midst of two national public health crises, a deadly flu season and an opioid epidemic that has been largely ignored by the White House. Days after Fitzgerald’s resignation, the Washington Post reported that CDC employees had flooded an internal messaging board with praise for the return of its acting director, Anne Schutat. Clearly, the American public should expect more from its nonpartisan appointees. Boris Niyonzima is a College sophomore from New Milford, N. J.